Last week I attended an insurance summit in Silicon Valley, California, where I spoke about the future state of claims, and how insurers can re-build trust with their customers. 76% of insurance customers said having a claim settled quickly was most important to them. 71% of insurance customers said having a claim settled in a respectful manner was second most important to them. 69% of insurance customers said having control over the way a claim is settled is the third most important to them. This shows that the way in which claims are handled is still a key area for consumers. Surprisingly, the research also revealed that price is relatively unimportant when buying insurance, even though being rewarded for loyalty is a key issue for many. There are three trust factors for any organisation who are looking to build long-term sustainable value: connection, communication and visibility. In my opinion, this is where insurtechs will have the greatest opportunity in working with insurers in building trust along the entire value chain. In today’s climate, claim organisations continue to try and put lipstick on the pig and dress it up in different ways. Instead, they should take a step back to look at building trust, connection, visibility and communication, which is the foundation of better results. No amount of lipstick however colourful will change the outcome. We need to think differently. Trust is a function of disconnection and separation. When the customer begins their claim, insurers have their complete trust. However, as the claim process unfolds, each layer of separation and disconnection throughout the claim reduces that trust until there is little trust left. This is the area insurers make the hardest for customers wanting to know how they can lodge a claim, how can they share information, what’s required of them and what are the next steps. This is how insurtech can help improve the three trust factors in the insurance value chain. As an example, Uber and Airbnb did exactly this by understanding the ecosystem they were about to challenge. They worked out the needs of the customer, they removed all friction points and they took on the most traditional markets and they won. Both disruptors worked out quickly that all participants needed a win/win situation. The Uber driver and the Uber passenger is a win/ win. For Airbnb, the customer who has access globally to all levels of affordable accommodation, and homeowners who can now generate income from sharing their homes, again is a win/win for both parties. However, the fundamental ‘secret sauce’ to all these disruptive ecosystem platforms is they must manage and build trust on a mass scale. Uber and Airbnb achieved this by creating connection, communication and visibility, as well as asking their customers to rank their experience which is then shared with others. Putting customers front and centre of every digital activity has not only scaled adoption, but also allowed companies to capture previously unimagined value. The tools that make these platforms successful, we have access to every day and have become part of the new norm. How can insurtech help build trust? Historically, insurers have applied many rules, checks and balances to the entire claims process that in many geographies the claim function, teams and value chain is paralysed. Claim handling expenses continue to increase, repair and replacement costs are on an upward trend as suppliers build in costs and unfortunately long cycle times feed into the frustration and agitation of their customers. 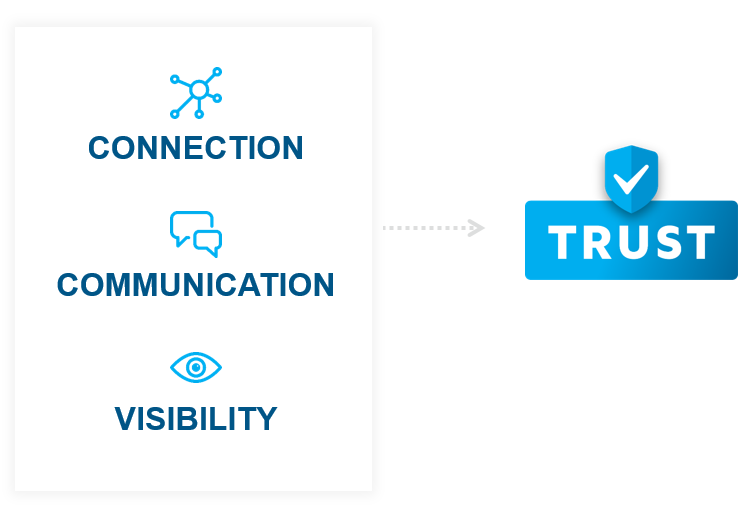 All stakeholders in the claims journey are at this point because of three key factors: lack of connection, communication and visibility and, they don’t trust each other. In today’s competitive and very challenging marketplace, insurance executives are increasingly charged with finding ways to attract and retain customers, control claim costs and handle expenses and improve NPS scores, all while being driven to reduce cycle times. The key challenge here is insurers have strategic objectives to meet, but continue to forget they are only one cog in the insurance value chain ecosystem. Its only when cogs are considered equally can we start seeing incredible possibilities for the future value chain model. 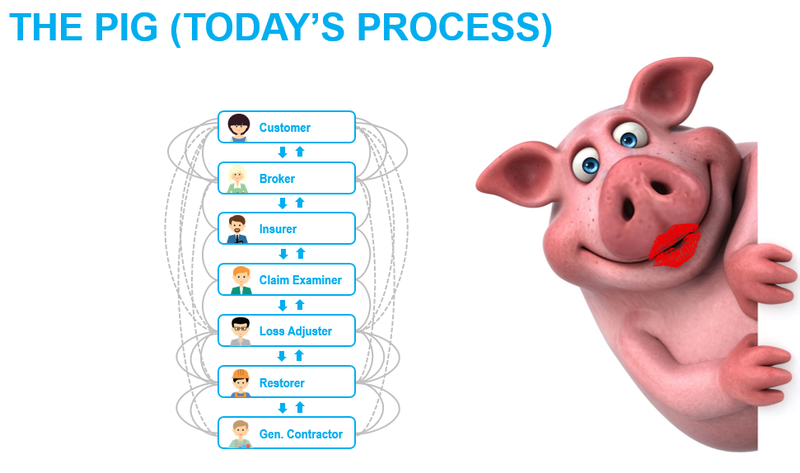 Every participant in a property claim was connected from the customer, agent, insurer, adjustor, restorer and general contractors? Every participant knew what was required of them? All participants in the claim value chain were truly aligned to managing claims size and cost, the customer experience and the speed in which claims should be processed? No participants including the customer, was ever left uninformed, confused or frustrated by the lack of communication? The insurance claim value chain was incentivised and rewarded for providing timely and responsive services, fair and reasonable pricing, and was done so in a way that left the customer feeling positive about their experience and promoting their insurer to others? Insurtech is the fastest, safest and best way to deliver trust to the customer. For claims management, digitally connected claims communities are the future of claim fulfillment and customer engagement. 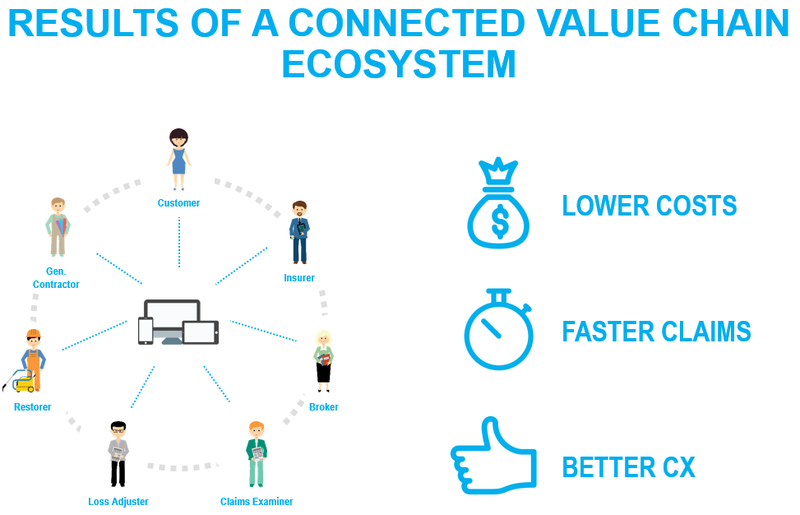 Like Uber and Airbnb, all participants in the ecosystem benefit equally creating claim communities of trust and value. The outcomes for insurers will be significant, the speed of the process will set new standards, and the value chain including the customer experience will be changed forever.